In this article we survey recent results on the holomorphic functional calculus for sectorial operators on Banach spaces. Starting from important classes of operators with a bounded H ∞-calculus and its essential applications we show how the classical Hilbert space theory of the H ∞-calculus can be extended to the Banach space setting. In particular, we discuss characterizations in terms of dilations, interpolation theory and square function estimates. These results lead to perturbation results which in turn allow us to verify the boundedness of the H ∞-calculus for new classes of partial differential operators. 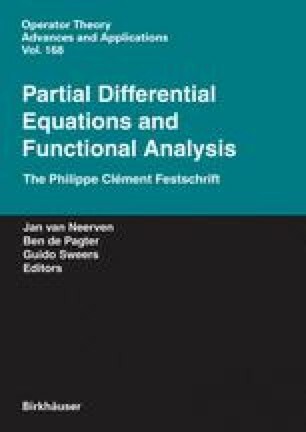 It is a pleasure to dedicate this article to Philippe Clément in deep appreciation of his path breaking mathematical contributions and his enthusiastic personality radiating the joy of mathematics.